The Phonetic Alphabet pictures and letters and The Phonetic Alphabet Control Booklet are used in pre-primary and early elementary programs in conjunction with the sandpaper letters. Twenty-six pictures were selected to match the phonetic sounds of the alphabet letters. 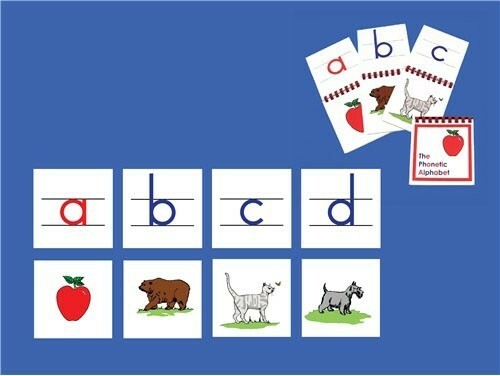 The Phonetic Alphabet exercise of matching pictures to letters is essential to supplement and conclude the study of the Sandpaper Letters. As the child learns to match the sounds of ă for apple, b for bear c for cat, d for dog, etc., the teacher can easily determine whether all the phonetic sounds have been absorbed and where particular help must still be given. All pictures are printed in full color. To aid the child in determining if a letter is upside down or reversed, a dot may be put in the upper right-hand corner of each letter card. The dot and the control booklet provide a control of error. The printed letters are in lower case and are positioned correctly between two ruled lines as an indirect preparation for writing. The Phonetic Alphabet (CME Notes) are available for purchase.